Electric shift repairs require the 8 or10 bolt swivel housings be removed. Picture shows 8 bolt housing. Years 1967-1971 high profile exhaust housing are not interchangeable with later year 10 bolt housings. Sandblasted outdrive with 10 bolt housing years 1972-1977 with 3 bolts at the back, 2 at the front on each side. Swivel housings can be separated from outdrive case by inserting item into tube seal area and lifting upward. Shift wires rubber protective tube, will slide to the side on wires to access connector terminals. Surface area should be cleaned holes re-tapped 1/4 inch 20 national coarse thread. Remove top seal insert screw drive and pry off. 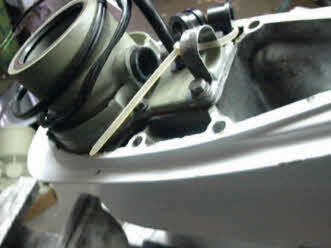 Remove oil seal middle of swivel housing through small opening. Install 2nd seal 1/8 inch offset from retainer area with loctite holding half of seal. Note loctite holds over 1200 lbs per square inch with less than .010 gap in materials.